The Timetable view renders one or several days, which are divided in intervals of your choice. You can record several events at the same time. 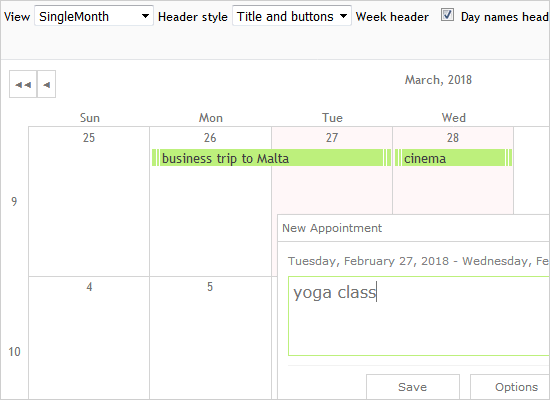 The classic monthly calendar where users can clearly see their appointments and scheduled events in the calendar cells. This view renders several months at a time, cells with events are highlighted. The number of months to render is custom-set. The view lets you render one week at a time or a week on each row. The number of days to display at each row is customizable. The resource view is a grid here you see all appointments grouped by each member of your team or by each office/location. It supports several timelines, which let you control the number and size of the cells. This view displays the appointments in horizontal or vertical lists. The time unit of the cells is custom-set as well the total number of cells and visible cells. Various notification and validation events are raised for each action performed by the user. The events provide useful information about the action as well possibility to cancel the event. All schedules and calendars are styled through CSS themes. Each theme provides you with CSS classes for any detail on the schedule. The control ships with a set of various predefined CSS themes, which you can use directly or fine-tune as you wish. In addition, viewSettings classes provide the means to control how each view looks as a structure – what type of header, title, date and time format is used etc. The whole schedule or selected items – resources, contacts, locations and tasks – can be saved into a Json or XML file. You can load the data back to the schedule when necessary. Complete localization of the schedule is available through the locale object, whose fields you can see in the samples with the control. You can translate all fields or only those used by your application in a language of your choice. The Recurrence, Appointment and Reminder UI forms provide the users of your software with a convenient way to create, edit and delete appointments and tasks.